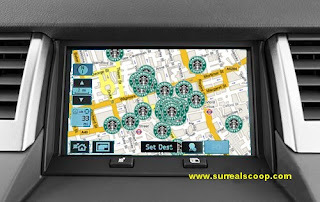 A new range of satellite navigation systems has been launched which are capable of providing car drivers with directions to their nearest Starbucks coffee shop as well as optional directions for non-coffee purposes and data about traffic jams, speed-cameras and accident black spots. "Today it is more important than ever that motorists have the security of knowing where their nearest opportunity for some overpriced frothy milk is," said Austin Billingsworth of the RAC. The new systems also integrate into a car's vehicle management system to provide emergency warnings in the event that the driver has not stopped for the suggested 15 minutes and had a caramel-Macchiato with cream every three hours of driving. It will also sound an alarm if the amount of fuel remaining is insufficient to get the driver to the nearest Starbucks, warning if the only coffee available is from a petrol station vending machine. "We think this service will help cut down on road rage incidents," said Mr Billingsworth. "Studies show that most random direction changing is caused by female shoppers running low on caffeine. Mind you they do that out of their cars too." The new systems have only recently become possible because of the availability of ultra-high resolution GPS data from upgraded direction finding software. "Traditional GPS systems are accurate to about ten metres," said Billingsworth. "This may be good enough to land a plane, or aim an intercontinental ballistic missile, but it would never be good enough to distinguish between each Starbucks in an average town." Rival systems are soon to be made available. A consortium led by Café Nero and Coffee Republic are believed to be investing heavily in Europe's replacement global positioning system, Galileo, while last week saw the latest Chinese rocket launch carrying the first of the Costa Coffee satellites into orbit. at last , ive been waiting for this for ages, now i can get from eltham to any location making sure i have the essesntial top up of caffine.my life is complete! !